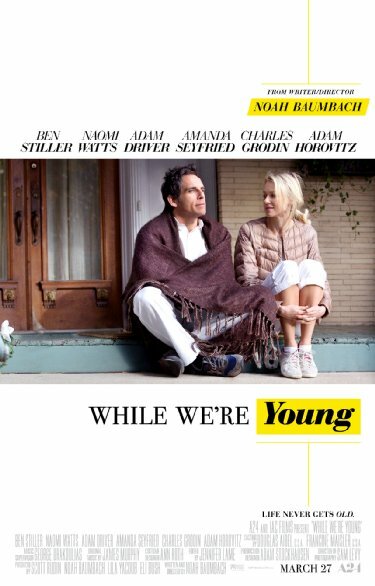 I caught a semi-advanced screening last night of the new Noah Baumbach film While We’re Young, which is expected to hit theaters here in Austin in the coming weeks. This is my first Bambach picture, as I’ve yet to see the independent filmmakers other acclaimed classics like The Squid and the Whale, Kicking and Screaming (Not the Will Ferrell one), Greenberg, and many more acclaimed indie flicks. Baumbach collaborates with the star of Greenberg, Ben Stiller, in this film, which has a fairly interesting concept of trying to recapture golden years of ones life (and yes, David Bowie’s “Golden Years” pops up a time or two during the film). The film boasts an impressive cast that also includes Naomi Watts, Adam Driver, Amanda Seyfried, and even Adam Horovitz (most will know him as Ad-Rock from the Beastie Boys) has a supporting role in the film. Here’s my review of While We’re Young. Stiller and Watts play a married couple living in New York City. Stiller is a struggling documentary filmmaker and Watts is the daughter of an acclaimed documentary filmmaker, whose played by legendary character actor Charles Grodin, whom Stiller is constantly envious of. As Stiller continues to struggle with a film that he’s been making for the past 10 years, he meets a young couple in New York that he begins to develop a bond with. That young couple is played by Driver and Seyfried, with Watts and Stiller seeing a younger version of themselves in them. The young couple introduces the older couple to a lifestyle that makes Stiller and Watts feel more alive, and could help save their child-less marriage. Baumbach wrote and directed this film, and produced with Oscar-winning producer Scott Rudin, whose name is behind some of the best films of the last 20+ years (No Country for Old Men, The Social Network, and so on). I’m kind of at an interesting position with this film, which is a position that I’ve had a few times with films in the past. I’m happy that I was able to see this in advance for free (Well, the meal I ate at the Drafthouse wasn’t free, but the film was) because I don’t think I would’ve paid money for the film. It’s not to say the film is bad, in fact it’s quite good and features some fine performances, but I don’t think I could recommend seeing While We’re Young in the theater. I think you’d get as good if not better of a time watching the film at home on HBO or on Demand when the film is released in that format. Ben Stiller and Naomi Watts are both very good in the film, with Watts being the standout of the two. I was a little bamboozled when I saw Horovitz walk into frame, since I know the man primarily from his work with the Beastie Boys and not the screen, but he was pretty good in the film. He plays the husband to Maria Dizzia’s character, a couple that both Stiller and Watts are friends with, and pressure the couple to have children. Adam Driver is quickly becoming one of my favorite young actors working today, and he’s arguably the standout performance of the film. It’ll be interesting to see if Driver continues to do smaller films like this, since he’s about to blow up in December with a little film called Star Wars. Everybody is really good in the film, but one of my biggest problems with the film was pacing. It was really slow for me in the beginning of the film, and it did begin to pickup toward the end of the second act and third. But one of the problems that I had could also be one of the films best aspects, and its this twist that they have midway through the film, which I won’t reveal, but its symbolic of the mindset that millennials have compared to the Gen-X’ers who are now all in their forties. I’m not sure if I dug it for what it symbolized, or if it was a way to save the film from being too slow. Again, if you need to see While We’re Young, I’d just wait till it hits on Demand or HBO. I don’t recommend going to the theater to see this one. I’d save up my money for the upcoming summer movie season, which looks to be massive (Speaking of which, I either need to find an advanced screening of the new Avengers film or buy tickets pretty soon). There appears to be a film coming out nearly every weekend that looks promising, independent and studio-wise, so I’d wait out the month of April for that.